It’s 1953 and in the aftermath of his last case, Emmanuel Cooper has been forced to resign as detective sergeant in the South African police force and he has been reclassified as ‘mixed race’ in the wake of new race laws. He’s relocated to Durban and is now working in and around the docks whilst moonlighting for his ambitious ex-boss, Major van Niekerk, spying on corrupt officers. Whilst patrolling the freight yards one night he discovers the body of a young white boy. He knows he shouldn't get involved, but his old detective instincts kick in and he starts to investigate. Shortly after his landlady and her maid are found murdered. The local cops target the simplest explanation - that Cooper is responsible - and arrest him. van Niekerk uses his political clout to set him free, but he’s only forty eight hours to clear his name and discover the real killer before he’s back in the frame. 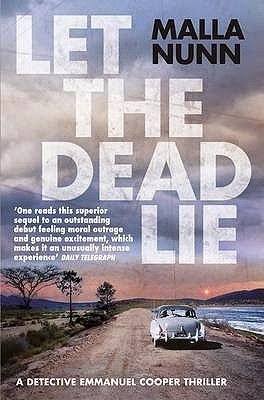 Let the Dead Lie is the second book in Malla Nunn’s series set in 1950s South Africa. The strength of the story is the characterisation, its historical contextualisation, and atmosphere and sense of place. Emmanuel Cooper is an intriguing character, a kind of nowhere man that belongs to no community, but somehow manages to straddle both white and black worlds. 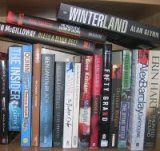 He is surrounded by other conflicted and flawed characters that are all well penned. The tensions and shifting social and legal landscape of South Africa is vividly bought to life, especially the marginal spaces around the Durban docks. Whilst the story is engaging and entertaining, I found the plotting and pacing a little tenuous in the first half, becoming more purposeful and sure in the second, turning into a real page turner as the political intrigue deepened and tension rose as Cooper’s deadline approached. Moreover, the story concentrates on the first murder and it never really became clear to me why the second and third murders occur. Overall, an interesting read and I’m looking forward to reading the third book in the series.